Television viewers across the nation got enticing glimpses of the Tortolita Mountains during last month’s WGC-Accenture golf championship – but that was mere eye candy. Trek into the Tortolitas northwest of Tucson – far beyond the fairways and featherless birdies – and you’ll discover a trove of scenic wonders in the rough. An extensive network of trails will take you into the heart of the range. It’s a world apart, but not far away, from the familiar trekking turf of the Catalina Mountains and Saguaro National Park. “The trails in the Tortolitas are some of the best-thought-out, intelligently designed trails that I’ve ever seen,” says Larry Linderman, chief hiking guide for the SaddleBrooke Hiking Club. “The way the trails interconnect, you can make a short, two-hour hike or an enjoyable six-hour day hike,” Linderman says. Some 29 miles of trails traverse the area, which includes classic Sonoran Desert terrain, rugged ridges, diverse wildlife, historic ruins and signs of prehistoric inhabitants. The trails were constructed, starting in 2004, in a cooperative effort by the town of Marana, Pima County and the Arizona Land Department. Expansion of the trail system is continuing. The first month of spring usually brings good hiking conditions. Later in the season, consider an early-morning trek to get the sights sans the midday heat. Take North Oracle Road or North La Cholla Boulevard to West Tangerine Road. Go west on Tangerine to Dove Mountain Boulevard and follow the boulevard to the Ritz-Carlton, Dove Mountain resort entrance. The staff can direct you to trailhead parking – on the right side of the drive as you approach the resort. There is no fee to use the area. Dogs must be leashed. The Wild Burro Trail is a gateway into the Tortolita range – providing links to the Lower Javelina, Upper Javelina and Alamo Springs trails, as well as additional connecting routes. For a short, easy ramble, simply follow the Wild Burro Trail for a mile or so in its lower reaches and return the way you came. The trail follows a broad, sandy wash and meanders past cacti and desert trees. A moderate loop route begins with a short approach on the Wild Burro Trail and then picks up the Lower Javelina Trail for a loop passage before reconnecting with the Wild Burro. A longer loop departs the Wild Burro Trail onto the Alamo Springs Trail and follows Alamo Springs to a reconnection with the Wild Burro. Use a trail map to cook up longer treks involving the Wild Mustang and Cochie Springs trails. The map is available by going online to www.marana.com/index.aspx?NID=785 and clicking on the map link. A trek in the Tortolitas is a journey into national park-quality desert country – where some 600 species of plants create a comely, prickly, colorful landscape. Palo verde, ironwood and mesquite trees thrive alongside cacti including chollas, barrels and grand stands of saguaros. 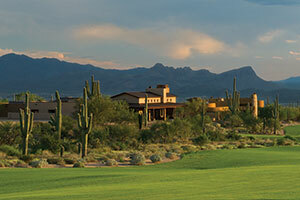 The range boasts a large population of crested saguaros – those with unusual flourishes of growth atop the trunk. “I personally have found and documented 43 crested saguaros” in the Tortolitas, says Gary Borax, an avid hiker and founder of a group called the Dove Mountain Hikers. Members have contributed many volunteer days helping to build and maintain trails in the area. Golf fans recently spotted a Tiger (Woods) at the foot of the Tortolitas. Hikers venturing into the range can hope for some fascinating sightings of their own – anything from birds, lizards and snakes to rabbits, coyotes, javelinas, bobcats and deer. Petroglyphs, or rock carvings, in the Tortolitas date to a period between AD 1100 and 1450, according to a brochure funded by the Marana Parks and Recreation Department. Ancient Indians, known today as the Hohokam, pecked geometric designs and figures of animals and people onto rock surfaces – and their work endures today. Elsewhere in the Tortolitas, hikers will pass the ruins of one-time ranch buildings. One now-roofless, stone-walled structure basks in silence and desert sunshine along a winsome stretch of the Wild Burro Trail. Wild horses roam the Tortolita Mountains. About 15 of the animals – technically known as feral horses – are part of a herd that has survived in the wild since at least the 1920s or 1930s, by some ranchers’ estimates. Contact reporter Doug Kreutz at dkreutz@azstarnet.com or at 573-4192.